NHS Trusts are setting up private companies in a bid to reduce their VAT bills - but staff fear the new bodies could threaten the future of our NHS. NHS workers are on strike today over outsourcing, after a Greater Manchester Trust looks set to move nearly 1,000 staff to a private company. Staff working at three hospitals in the Greater Manchester area are walking out over plans to outsource their jobs to a new company set-up and owned by the NHS Trust. The move is part of a national trend for NHS bodies to set up private companies, seemingly in order to reduce their tax bill. Private companies are able to claim back VAT on certain services, to reduce their tax liabilities – creating a ‘perverse incentive’ for NHS Trusts to set up outsourced bodies. 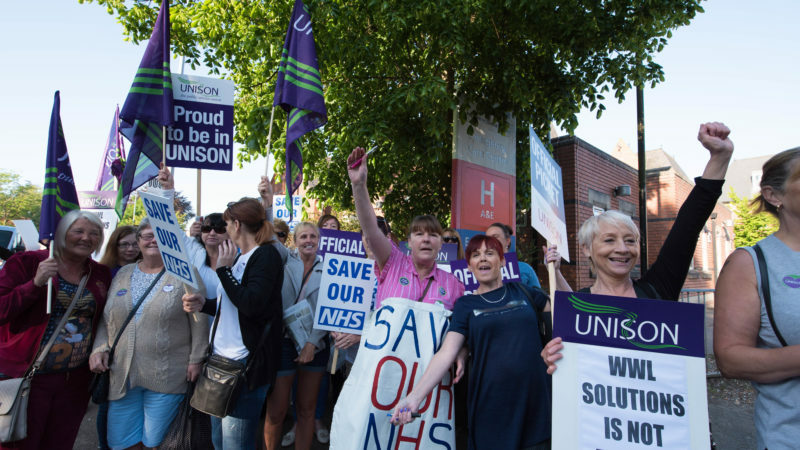 But Unison members at the Wrightington, Wigan and Leigh NHS Trust have overwhelmingly voted to reject the plans there, with large majorities in favour of walking out today. Members of the Unite union are also joining the action. They are worried that their terms and conditions could be cut – and that new starters will get inferior pay and pensions, with staff fearing they could all ultimately be moved to a private-sector company. The health workers being transferred tend to be the lowest paid within the NHS, such as porters and cleaners, according to the union. “What happens if the new company goes bust? It’s a risk we don’t want to have to take. “I’ve never been in this situation before and it’s nerve-wracking and stressful to be going on strike. But we are all determined and staff are being very supportive of one another. Freedom of Information requests by Unison found last month that Wrightington, Wigan and Leigh NHS Foundation Trust has spent over £154,000 on consultants to create the WWL Solutions subsidiary – in order to outsource staff. “We want them to withdraw this proposal – it’s been overwhelmingly rejected by their staff. We’ve had three ballots on it – every time we’ve had 70% turnouts or more, with around 80% voting against the Trust’s proposal. “The next generation of cleaners, porters and domestic workers will be on worse terms than them. These workers love the NHS. NHS Trusts across the country are shelling-out huge amounts of money on consultants, with companies advising trusts on the setting up of wholly owned subsidiaries – which staff are then outsourced to. The amount spent by just 15 Trusts in England on setting up these new ‘sub cos’ is already in excess of £3.2 million, according to the FoI requests. The battle against these plans is stepping up, with Labour figures such as Lisa Nandy MP joining the picket lines this week.